From left: Rachel Trombley, Anita Williams, Aleyda Villegas, Investigator Edward Hull, Alicia Tolbert, and Michelle Sargent are only a few people involved in child abuse intervention in Blount County. 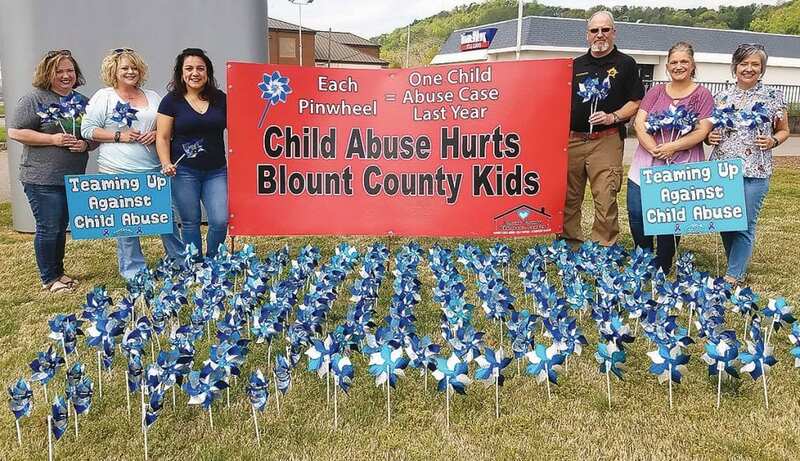 As the number of child abuse cases continues to rise each year, the Blount County Department of Human Resources (DHR), Blount County Children’s Center (BCCC), Blount County Sheriff’s Office, and the District Attorney’s Office (DA) have a mission to protect children. Some cases require all agencies to work together, while other cases are investigated independently by DHR to uphold the mission. April is considered Child Abuse Awareness Month; therefore, the BCCC displays blue pinwheels at Cadence Bank for the entire month to raise awareness of child abuse within the county. This year there are 204 pinwheels, which represent 204 cases investigated in 2018 as a joint effort by the above agencies. This, however, is just a portion of reported cases for 2018. In all, there were 725 investigations, including the 204 that were completed by DHR. That number could easily be higher for 2019, as DHR has already investigated 254 cases as of April 12. No two cases are alike and each case is handled accordingly. It is often a thankless job, but children need to be protected from the perpetrator, these agencies work tirelessly at protecting the victim. Protection of the children can include establishing enhanced protection in the home, or it could lead to the removal of children from the home. Regardless of the situation, the main goal is to protect children. BCCC director Jim Ed Clayton said 204 cases is the most they have investigated in a year and that children “living on the Internet” has caused an increase in cases. He said, “Children are wandering around on the Internet and falling victim to predators.” He went on to say that Blount County is fortunate to have a DA who will go to bat for victims. On April 23, the BCCC will host its annual Blue Ribbon Dinner at Anchors Church. Tickets are $40 for individuals, or a table for eight is $300. They need to be purchased in advance by calling the BCCC at 205-274-7226. “This year, as in previous years, attendees will be served a delicious meal prepared by Lee Alexander and his staff from Charlie B’s Restaurant. Lee and his staff take great pride in preparing a meal that is a treat for the eyes and the palate. Folks will definitely feel like they got their money’s worth. “Each year, the Blue Ribbon Dinner features exceptional entertainment. This year attendees will be treated to entertainment by The Cotton Pickin’ Kids, six talented young siblings from Hanceville, and Ed Berry and his jazz combo Pizazz. When asked to describe the event for those who have yet to attend, Clayton said, “First of all, the Blue Ribbon Dinner is an important fundraiser for us. We’re a not-for-profit agency, not a government agency, and we have to raise funds so that we can exist. We provide critical assistance to abused children and their caregivers – hundreds each year – and we charge nothing for our services. So, folks who buy a single ticket or a whole table really are making it possible for us to do what we do. Several agencies will join DHR as they host their annual Child Abuse Prevention Awareness Walk on Friday, April 26, at 11:30 a.m. The walk will begin at the DHR parking lot and end on the courthouse steps, where there will be a short presentation. The event is open to the public and everyone is invited to attend. DHR supervisor Alicia Tolbert said, “Children are our most valuable asset in the county. Everyone needs to come together and protect this asset.” She encourages everyone to report any suspected cases of child abuse or neglect.